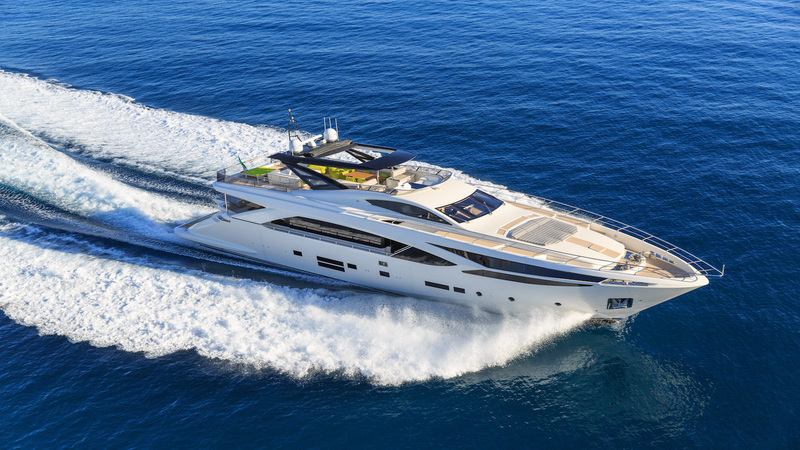 A brand new yacht, the 29.60m Amer 100 Quad Seataly was built by Permare in Italy and delivered in 2016. She features a white superstructure, striking lines and can cruise up to 24 knots powered by four Volvo Penta IPS 1050 engines. Her interiors have a cool and contemporary feel with classic beige soft furnishings and a pop of color to complement the vintage teak floors. Seataly is a very eco-friendly yacht making use of recycled vintage wood flooring and engines designed for reduced emissions. Her vintage regenerated teak is made out of recycled boards, typically used in Javanese houses 100 to 150 years ago. Her engines allow for optimal sailing performances with less consumption. The yacht won the award of “The most innovative yacht of the year” during the Cannes Yachting Festival 2016. The salon has a warm décor with Paola Lenti Sofas and smoked oak wood flooring. Moving forward, there is an extendable dining table in polished steel and crystal made by Riflessi which can accommodate 10 guests. Seataly’s interior configuration has been designed to comfortably accommodate up to ten guests in five double cabins with king size beds of which 4 cabins can be converted into twin cabins. The master cabin is located on the main deck at full beam and has a direct open view of the sea. The cabin has a master study/office area and is adorned in mahogany and vintage teak. The ensuite bathroom is very spacious and offers a Turkish bath and a his & hers wash basins. The staircase leading to the guest cabins is made with polished steel and vintage teak giving a modern touch to the classic materials used. One can truly sense the comfort on board with the level of attention given to the interior details. The exteriors decks are made of cork, used for its lightness and its quality as an excellent insulator. It is 100% waterproof, rot proof and gives a pleasant tactile sensation while walking barefoot on it. The fly bridge is adorned with tasteful décor with lime green color and Paola Lento furniture comprising of two poufs, the sun chairs, chairs around the lunch table and two bar stools. Seataly features a Jacuzzi on the fly bridge with a bar and plenty of sunbathing areas for total relaxation. The flybridge includes a hard top should one wish to be in the shade. The yacht is also equipped with zero speed stabilizers among other amenities to ensure a smooth cruise. Seataly runs with 4 crew onboard to ensure a relaxed luxury yacht experience.